Japanese make the best fans in the world, not only the folding paper type, but also the flesh and bones variety. Find a sports team, musician, or actor who has been lucky enough to inspire a following in Japan, and then marvel at their tales of focused fan adulation, group zeal, and yes, shared dependency. A famous case is the Hanshin Tigers baseball team. This club is blessed with a hard-core fan base that never ceases to clap, beat drums, chant in unison and wave huge flags — before, during and after each and every game, home and away, season in and season out — in a manner reminiscent of a World Cup Finals. The fact that they do this regardless of the flow of the game or its outcome leads one to believe they see their performing as essential to the overall event as the pitching, hitting and fielding — in other words, they provide the crucial context in which the game can be played out. Curiously, the Tigers home ground lies in the shadow of Osaka, where for at least the first half of the 19th century a remarkably similar tradition of fandom existed around the theatre. As kabuki scholar Andrew Gerstle describes in the catalog for the recent "Masterful Illusions" ukiyo-e exhibit at the Smithsonian, Osaka theatre depended for its vitality on an extended concept of "performance," involving active collaborations among actors, patrons, fan clubs, poetry circles, amateur ukiyo-e artists and print publishers — to name just some of the "players." Kabuki is actor-centered theatre and each group mentioned by Gerstle (who is building on the pioneering work of the late Matsudaira Susumu) played a key role in continually fanning cult-of-the-actor fervor. Constant popular excitement was important to maintain, because it was only through having transcendent experiences with kabuki that Edo period townspeople could come together in a relatively free, classless, fun-filled way, and create for themselves a distinct social identity. Like some avant-garde Off-Off Broadway experience (or baseball, for that matter), the attraction on center stage served merely as the catalyst or pretext to bring a disparate crowd together and focus it as a community. The true meaning in the event was the social cohesion produced, across class and generation, and the all-important, shared collective memories. It is true that print-making forces in Osaka were dedicated almost exclusively to the task of glorifying actors. However, an occasional design focussed on one of the other players in the larger scheme. 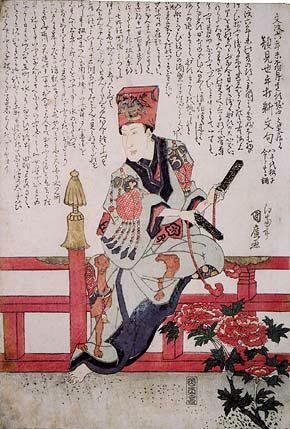 Fig 1, for example, a deluxe by the Osaka artist Kunihiro (active 1816-41) depicts not an actor, but the head clapper of the Sasase-ren (The Bamboo Grass Group). Sasase was one of several large fan clubs that supported kabuki in general (as opposed to individual actors), and here we see one of its leaders taking to the stage of the Naka Theatre in Osaka (in the 11th month of 1823) to help welcome the actors back for the start of a new season. It was the custom at such times for the various support groups to dress up and perform chants and rhythmic clapping, both on stage and from their seats, in the course of a long day of actors" speeches and virtuoso theatrical turns. The words are given in the print, along with fascinating facts about the habits of camels — that they weigh 400 kilos, they can walk 400 kilometers, they eat 4 kilos a day, etc. For knowledgeable actor print collectors, almost as curious as the extravagant attire and delicately inlaid clappers of Roju's (Roju would be his fan club handle, not his true name, in keeping with the freedom from rigid class strictures the theatre world offered), is the fact that the print boasts a publisher’s seal, namely that of Tenmaya Kihei, or Tenki. Tenki seems to have been owned by Kunihiro, but even so, deluxe, special interest prints like this one — generally thought to have been produced only in small numbers for private circulation — rarely feature the name of the workshop. The prominence of the publisher seal here — alongside the peony, whose appearance is also a bit of a mystery — suggests that Roju may have been enough of a city-wide celebrity to justify a standard commercial edition. If so, the cheer meisters of the Hanshin Tigers should hope that their likenesses are being considered for inclusion among next year"s baseball cards. This article originally appeared in Daruma, no. 41, Winter 2004. Copyrighted © text and pictures reprinted with permission.